DNA and genetic testing are currently gaining importance as an integral part of modern science and medicine. Understanding our genetics means understanding the basis of our unique biology. Genetic testing enables us to counsel our clients according to their unique genetic profile. The test results help optimize your diet to your genes in order to reduce your risk of certain health conditions and diseases. Each gene tested is significantly involved in the way your body processes or metabolizes a certain nutrient or dietary component. With that information, we know which foods and nutrients your body needs more – or less – of to prevent chronic diseases such as cancer, heart disease, stroke and type 2 diabetes. Programs tailored to an individuals DNA have proven to be much more effective than generic programs. A recent study published by the European Society of Human Genetics found that dieters employing weight management programs tailored to the individual’s genome lost up to 33% more weight than those following standard, “one size fits all” weight loss programs. With the latest genomic technology, any health management program that does not take an individual’s genetic profile into account is simply guesswork. Nutritgenomix Inc., which is a University of Toronto startup biotechnology company that is dedicated to empowering nutritionists anddietitians and their clients with comprehensive, reliable, genomic information with the ultimate goal of improving health through personalized nutrition. Genetic Directions, a US company affiliated with 23 & Me, whose Genetics Research team is led by a top researcher in the field of exercise genomics, Dr. Mark Sarzynski. Teir team is constantly reviewing newly published research, and they regularly update our solution protocols to include newly identified genes and to provide our customers with the soundest scientific basis for our health management programs. 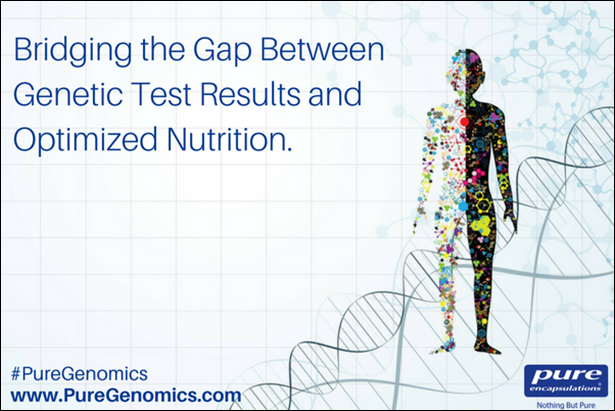 I offer genetic testing as part of nutritional and health therapy consultations. The service includes the genetic test kits, genotyping and customized reports based on cutting-edge research and stringent standards of scientific evidence. PureGenomics: This test provides reports on genetic variants that are relevant to health and are responsive to nutritional support. The test is free of cost for existing 23&Me customers. Consult is based on my hourly rate.